There is so much elitism in the art world that I jokingly tried to argue that Katy Perry was a postmodern performance artist to some artist friends only to be confronted with eye-rolls. Katy Perry is a pop singer known for “California Gurls”. Her stylistic choices may look and sound like a generic pop band, but there is actually a lot to think about here. She spends hours refining her craft. She spends a fortune creating her music videos. Her brand is so successful that she’s even played the halftime show at a super bowl. It would be wrong to state that Katy Perry is not a serious artist. In Katy Perry’s music video for “California Gurls” we enter a world so different that we are bombarded with visual sensations that create both a memorable and unique experience. Baudrillard and Jameson argue that Postmodernism is best expressed through Novelty and Nostalgia. Is Katy Perry an embodiment of Postmodernism due to her consistent inclusion of novelty and nostalgia. This begs the question – Is Katy Perry a postmodern artist? Postmodernism is the technical and theoretical rejection of traditional norms and genres. A pop musician focuses on the performance and rejects the idea of utilizing instruments to create music in the same way that a performance artist isn’t creating a tangible object. Theoretically, a postmodernist rejects the ideology behind a larger movement. Katy Perry’s “I kissed a girl and I liked it”, questions sexual identity and the idea of gender roles. 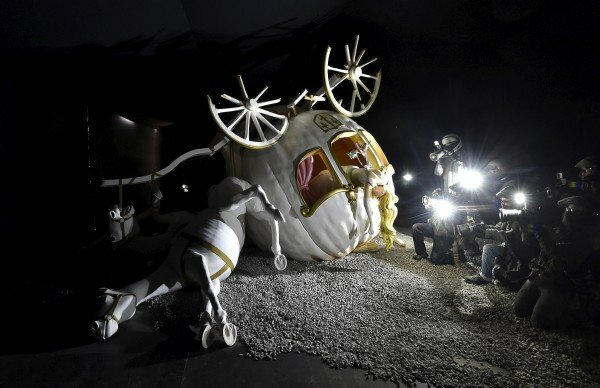 Banksy’s Dismaland, was a simulacrum of Disneyland, an experience where one is bombarded with ironic and sarcastic interpretations of western society. Postmodernism effects every aspect of life including the aspects of architecture and music. Katy Perry is the musical equivalent of contemporary artist Damien Hirst or Banksy whose visual scenery takes the audience into another world. Continuing on this strain of thought, Juxtapoz and Hyperallergic publish art that exists within the novelty context. Don’t believe me? Look at the headlines one can find by a simple observation.“The many challenges of dining with Animals”, “A look inside toilet paper Vol. II,” or how about this mile long wooden xylophone that plays Bach when a ball is rolled down it? Postmodern art is a kitschy mix of nostalgic symbols and ideas, aimed at questioning the very logic or basis of those ideas, often as humorless parodies. Which is exactly what we find in parts of Katy Perry’s brand. Big Museums and Fine art Galleries aren’t immune to Novelty either. In September 2015, the Center for Visual Arts displayed contemporary Chinese art which was a post-modern imitation of the West. The traditional idea of Chinese Art; stereotypical watercolor buddhist paintings re-interpreted. Many artists payed homage to Western historical figures but with a traditional Chinese stylistic twist. 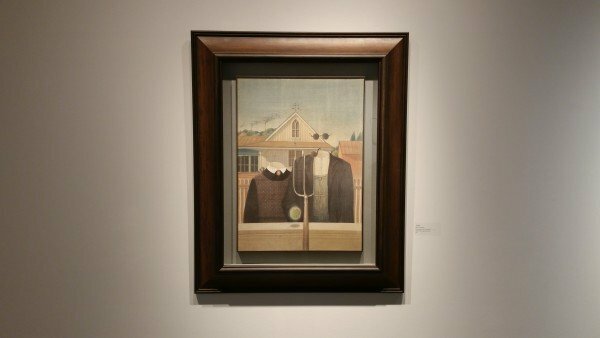 The Artist Jin Sha reinterpreted “American Gothic”. Can anyone argue the lack of novelty here? It’s American Gothic, except without heads! The Art on display was a nostalgic representation of the previous socioeconomic dominating power – the West – and the West’s effect on the rest of the World, synthesized with the West’s expectations from those artists; i.e. Chinese artists still have to use Caligraphy and watercolor in order to be considered genuine artists by western scholars. I wonder if the art on display at the CVA truly represented contemporary Chinese artists, or if it could be deemed an example of Orientalism. There’s nothing wrong with postmodern art or Novelty, it’s only wrong for these very same “institutions” to think that they’re better than others. Just ask yourself, is this novelty any different than that novelty?